Action from a Bourne Deeping (dark shirts) game earlier this year. Photo: David Lowndes. Bourne Deeping Dragons attempt to book a date at the Olympic Stadium by winning their English Hockey Trophy semi-final against Guernsey at Sir Arthur Mellows Village College tomorrow (March 20, 1pm). The East Division One side host Guernsey with winners going to play a final at the beset hockey stadium in the country. It’s a tough ask for Bourne Deeping though as the islanders have reached the final for the last four years, but they are confident of an upset win. Captain Richard Collins said: “It’s the furthest we’ve ever gone in the competition and we’ve beaten three teams who play in a higher standard than us. “Guernsey obviously have great experience, but then so do we. Over half of our starting line-up played National league level in their prime. “This, mixed with the younger players who are coming through the club, has become a successful combination and has been the main recipe for their success this year. “We’re currently in our highest position since reforming as Bourne Deeping. We are hoping for lots of local support to create a great atmosphere on the day. Deeping, unbeaten in the league since December, warmed up for the big day with a 5-1 Division One win over City of Peterborough thirds last Saturday, March 12. James Sharpe (2), Rich Collins, Ben Slack and Andy Williams scored the goals. Wisbech Veterans over 40s are already through to a National Final at the Olympic Park. 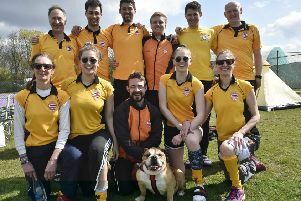 They reached the Masters Shield Final with a 7-2 semi-final thrashing of Aldershot last weekend. Jody Betts claimed a hat-trick with Sam Markiliie (2), Nick Osborn and Brad Apted also on target to earn a final date with Norwich Dragons on May 1.